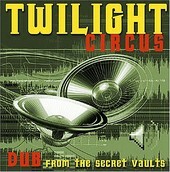 Ryan Moore's musical vision, Twilight Circus brings you twenty years of unreleased dub on Dub from the Secret Vaults, a record that pays homage to the history of ROIR, a big influence on Moore, as well as the history of dub, and the history of Twilight Circus. With fourteen tracks and nearly forty-five minutes of music, Twilight Circus delivers a spellbinding, personal look into the mindset of Moore and his dub offerings, giving you plenty of groove-laden, acid-drenched, purifying moments that will make you realize the power of dub. And, if you're not already a convert, convert you. I'll give it a B+.